We've featured an unusual number of mainstream designer fragrances here over the last month, so today we're going all the way to the other end of the spectrum. 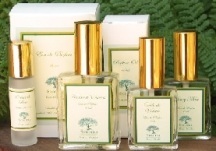 Sonoma Scent Studio is the California-based indie perfume house of self-taught perfumer Laurie Erickson, and she is one of several small etailers who have gained a following on the fragrance forum at MakeupAlley. My favorite from the line is Bois Épicés, described as "soft, warm spices over a musk/wood base", with notes of musk, sandalwood, nutmeg, cardamom, ginger, mandarin, cedar, cypress and coffee. I suppose everyone has their own idea about what constitutes a comfort scent. There are fragrances that so extraordinarily soothing that they function almost like spray-on Valium (Diptyque Tam Dao, Comme des Garçons Kyoto) but that don't quite qualify as comfort scents in my book. A comfort scent must be more than just soothing: it must be the perfume equivalent of putting on your favorite pair of beat-up jeans and a sweatshirt (preferably one that has been washed at least a hundred times and is soft as butter, and maybe has a hole in one elbow), and settling down on the couch to watch your favorite classic movie, one you've seen so many times that you can enjoy it without having to think about it (in my case, surely The Women or My Man Godfrey). The only thing missing from that picture is the chocolate bar. I wouldn't dream of watching My Man Godfrey without a really good chocolate bar*, and many of my own favorites in the comfort scent category have gourmand elements to one degree or another (La Perla Eclix, Molinard Tendre Friandise, Serge Lutens Rahät Loukoum, The People of the Labyrinths Luctor et Emergo, Fendi Theorema) but not all foody fragrances are comfort scents (Aquolina Chocolovers doesn't qualify, nor does Parfumerie Generale Musc Maori), and not all comfort scents are foody. I can't really define exactly what makes a comfort scent, but I know one when I see one, and Sonoma Scent Studio's Bois Épicés is most surely a comfort scent despite the lack of comfort-food notes. It is, as advertised, mostly woods and musk, and the spices, again as advertised, are subtle. It is lightly sweet, and has a mild creaminess that renders it almost edible (a milky wood pudding?) and the cedar adds a light whiff of pencil shavings in the dry down. The coffee adds a nice warmth to the finish without calling attention to itself. Bois Épicés is undemanding, as any good comfort scent ought to be, and also entirely unisex. The Eau de Parfum, which does leave a slight oily sheen on the skin, has good lasting power but stays relatively close to the skin. Sonoma Scent Studio recently introduced a lighter version, Bois Épicés Légère. It has more mandarin in the top notes, and the mandarin lingers much longer into the dry down, where the woods and spices are softer and more indistinct. Erickson recommends it as a "summer woodsy skin scent", and that is perfectly apt but it lacks the cozy vibe of the original, which is not heavy in any case. It is certainly worth a try if you find the "regular strength" too woody or too creamy. Bois Épicés was apparently reformulated at some time or another, and I don't know exactly when. It is available in perfume oil ($18 for 5 ml) or Eau de Parfum ($25 for 15 ml; $39 for 30 ml). Samples are available for $2.75 each. For purchasing information, see the listing for Sonoma Scent Studio under Perfume Houses. See also: Angela's take on comfort scents. * My current favorite chocolate bars: Dagoba Xocolatl, Dolfin Chocolat Noir A L'Anis Vert, Chocolove Ginger Crystallized in Dark Chocolate. Extra points (a lot of good that will do you) to anyone who shares their own favorites in the comments, and extra extra points (ditto) to anyone who knows of a really perfect dark chocolate bar with orange peel. The Cluizel is my fave in the orange peel category. Nice review, even though I don't care for Bois Epices. I do like several other SSS scents very much, including her new-ish Incense, which has a sweet note to it that, ordinarily I wouldn't like in incense, but works in this scent. It's not orange *rind*, but the best chocolate orange bar I've tried is Lindt's Dark Chocolate Intense Orange, which (IIRC) has very marmalade-y bits of orange and slivered almonds that make it delightfully crunchy. But thanks so much for the chocolate rec, I will look for it! Looks like Chocosphere carries the brand, and I've never tried any of them. And incense was too sweet for me — but if you happen back through, do tell me what else you liked from SSS. Well, I haven't exactly tried any of SSS's fragrances, but I do love chocolate. My favorite chocolates are, without a doubt, See's chocolates. See's is a California institution of the highest order. I love their truffles, and their peppermint patties are the best on the market, hands down. Never expensive or elitist, always completely satisfying, See's chocolates hit my chocolate spot every time. You mentioned pudding, dear R? Have you tried Trader Joe's Belgian Chocolate Pudding? It taste just like a deluxe Pot de Chocolate. Me likey! Oh lordy, Lindt Dark Intense Orange with almond shavings, YES!!! I second Freskagirl and urge you to try it, my all-time favorite! My comfort scents are generally foody, too, but not always. A spritz of Gaultier2, Chergui, Nuit de Noël or Encense et Lavande (if only I had some on me), an Agatha Christie/Nick Hornby book or a good comedy to wind me down (any episode of “As Time Goes By” with my dream-granma Judi Dench) and a cup of steaming moccha = heaven! I respectfully submit these for soul-satisfying comfort: Maya Gold chocolate by Green & Black, Trader Joe's Sipping Cocoa…Champa by Ormonde Jayne. Wish I had some now. Ok, that's 2 votes for the Lindt, will have to get one. LOL at “my dream-granma Judi Dench” — wouldn't that be perfect? OJ Champaca is an interesting comfort scent choice — I adore it but don't think of it that way. Will look for the foods! It's in the produce section where they have the prepared lunches and salads and sushi, etc. I am not really a “pudding person,” but I have to say that this stuff is creamy and delicious. Dusan, can't find your email! Want to send it to me? And, R, its not a bar, but here in Calgary, we have some chocolate-covered orange peel pieces at Bernard Callebaut. Not a big fan of his stuff otherwise but the orange peel is yummy. She is magnificent. Have you seen her in “Notes on a Scandal” alongside Cate Blanchett, another favorite of mine? Effortless is how I'd describe her in a word. Notes on a Scandal is next up on my Netflix list, looking forward to it! She is wonderful in everything, even James Bond. Actually, I really liked the latest James Bond. Ah, near where my stuffed grape leaves are, then. Will get some! Thanks, looking at his website now! Ooooh! CHOCOLATE!! I love 'Terry's Chocolate Orange', I think everyone must eat at least one segment every Christmas, and ANYTHING from 'Hotel Chocolat'. As for comfort scents I don't really have any, that is to say I've never used a perfume in that way before (I wouldn't wear one for bed after a nice bath or shower I don't think) but if something casual, easy to wear and not aggressive counts I think for me it would be Heliotrope by Etro or For Her by Narciso Rodriguez. I also love the Vanilla Spice products from The Body Shop at Christmas, I will admit to using them before bed especially as they are too strong to wear with anything else! Lastly, considering perfume and chocolate I will give my beloved Angel a mention as thats the two birds with one stone! E, sure!! I just dropped you a line in the Chene review comments cos I couldn't find your email address either, LOL! Thanks K — I have read about Ghyslain elsewhere (that website is drool-worthy) but not Leonidas, will have to investigate. Ha! I haven't seen the latest Bond, but of course Judi's been the perfect M so far Can't wait to hear if you liked the Notes. The book was good, too. The orange peel is the little stick at the bottom of the dark chocolate grid. Love the notion of a Valium scent. Lily of the Valium? Christian Diorzepam? Or maybe a celebrity scent: Cameron Diasepam? Wish I'd had this yesterday before the dentist treated two of my teeth. I thought Mentafollia the only appropriate dental-setting scent. Well, that's what you get for eating too much chocolate. I like those chocolate oranges too — have bought several for my son but he doesn't really like them so I get to eat them. And this year we discovered cocoa-flavored Peeps, which are either new or have simply escaped my notice. Hate dentists — you need that Smiley stuff too! I still haven't gotten around to smelling it though, might be horrid. Glad we agree at least on the definition, you *know* we don't agree on the scents themselves, LOL…none of those come even close to offering me comfort. We appear to have the same taste in comfort scents. Love Theorema (or rather loved it and miss it now) and you got me onto Luctor & Emergo & Tam Dao. Can you no longer find Theorema? It is not exported to the US, but it is still relatively easy to find here and I assumed it was even easier overseas. And yay! — Chocosphere.com has the Côte d'Or Sensations, I am plotting a huge order, thanks! Went to the trouble of creating an account to let you know that Green and Black's Orange Dark Chocolate bar is truly scrumptions, pure health food. When you feel like straying from the dark — try Les Voges Gogi berry bar. It's milk chocolate and hard to stop at just a couple squares. Has a saltiness that is really compelling with the creamy milk chocolate. Thanks, Sarah — that was very kind of you! Will look for the Green & Black, that one is actually in my local supermarket so not hard to do. I have trouble finding Vosges locally but will hunt that one down — I do like the Barcelona bar (almonds & sea salt in milk chocolate). NowSmellThis Newbie butting in to say I found Notes On A Scandal very interesting but utterly chiling. There was not one character who I really liked, but I felt I understood them all to one degree or another. It is very uncomfortable to feel that empathy with people whose actions you utterly despise. Plus really…15 year old boys were not interesting to me when I *was* 15–cannot imagine what attraction they might hold to a 30-ish woman. Laurie… what a wonderful review. I'm glad to see your work appreciated. M, they also have Vosges at Balduccis in Bethesda, if that is any help. No WAY?!?! On the way to Montgomery Mall!! How do you *know* these things? Do you have chocolate spies? I meant to ask/add earlier, this scent sounds very like me, given my love for soft pudding/wood comfort scents like KenzoAmour. Whaddya think? SSS Bois Epices is nothing like so foody pudding-ish as Kenzo Amour — it really would be a “wood pudding”. So I'm not sure! I love her fragrances, especially the woods. L, if you happen back through, tell me what your other favorites are!